Politicians have to do a lot of silly things at public appearances, and some of them handle the baby-kissing and tedious chit-chat more gracefully than others. President Gerald R. Ford seems to have been pretty good-natured about this sort of thing, even in the wake of the Nixon impeachment and even while being incessantly lampooned by Chevy Chase on Saturday Night Live every week. For reasons I’ve never understood, politicians and foreign dignitaries always seem to be presented with hats when they make an official visit somewhere, and when they come to Texas, they almost always get a cowboy hat. 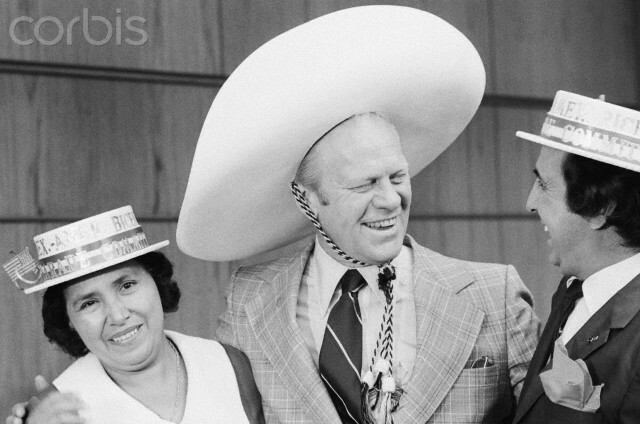 But on President Ford’s 1975 visit to Dallas and the SMU campus, he was made an “honorary Mexican-American” and was presented with a (very large) sombrero by Andrea Cervantes of the Mexican-American Bicentennial Parade Committee. He looks ridiculous, but it’s a fun ridiculous. I think he liked it — Mrs. Cervantes even got a kiss for her gift. The sombrero re-appeared a few months later, autographed and on display at Pike Park. It never left Dallas. What a shame. I would have liked to imagine the President and First Lady relaxing at Camp David, Jerry wearing his sombrero, smoking a pipe, and watching college football on TV, while Betty sat at the other end of the couch, chuckling to herself, and shaking her head. Top photo from CorbisImages, here. More on this in the Dallas Morning News article (with photo) “Ford Commends Group for ‘Feliz Cumpleanos'” (Dec. 15, 1975). This sombrero-donning was just seven months before the now-legendary “Great Tamale Incident” in San Antonio. Read how NOT to eat a tamale here. Ford took his gaffes in stride, even going so far as to appear on the show that made note of his every stumble, literal and figurative. Read a behind-the-scenes account of Ford’s 1976 Oval Office taping of one-liners for SNL — including his “Live from New York, it’s Saturday Night!” show opener (although I’m pretty sure he did it without the exclamation mark) — here.